So now that we have the “where,” we need to examine when to go storm chasing. 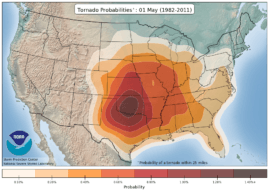 As previously stated, we conduct our storm chasing tours during the height of the Great Plains Tornado Season. Here are a series of images from the Storm Prediction Center that show when the most storms and tornadoes occur. Although the given graphic here shows data from 2008, it is fairly representative of a typical, “average” year. 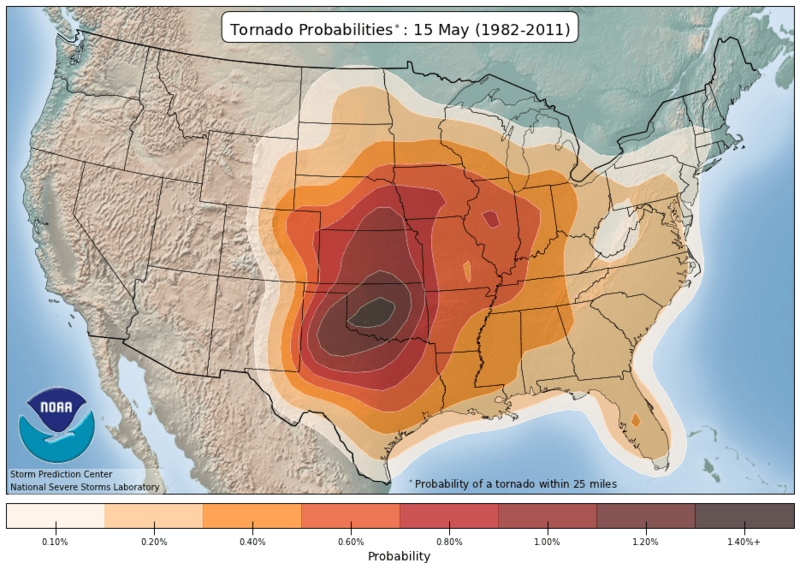 In the early part of the year, January to April, we can see that most tornadoes that happen occur in the southeastern part of the United States, typically along the U.S. Gulf Coast. This area is known meteorologically as “Dixie Alley”. 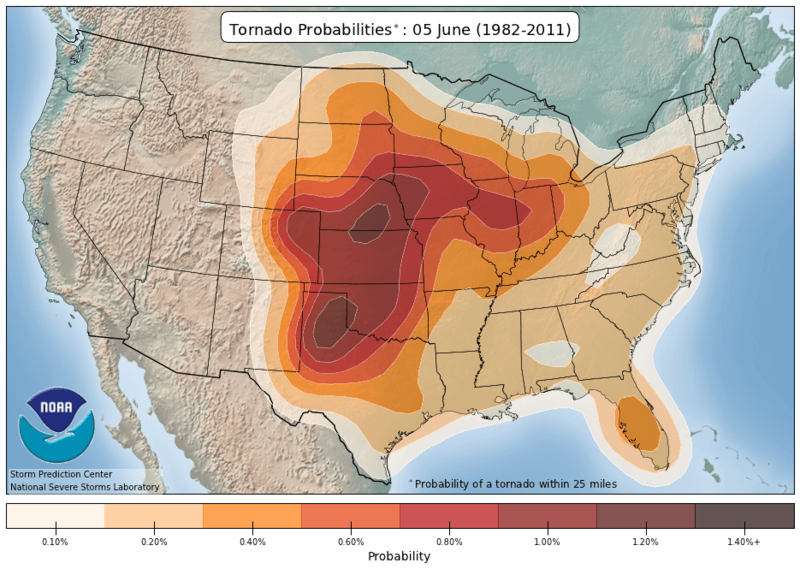 While a fair amount of tornadoes do occur in this area, they are not events that can be “counted on,” due to their infrequency. Further, the Gulf Coast and southeastern states (known meteorologically as “Dixie Alley”) are unfriendly for storm chasing due to an extreme amount of large trees that prohibit good viewing of storms and that also makes storm chasing in these areas much more dangerous – it’s difficult to make quick decisions if you can’t see what you’re dealing with. Thus, we do not conduct tour activities in “Dixie Alley”. In late April through to late June, the severe actively typically shifts into the Great Plains. This is dependent mostly on the jet stream which tends to “dip” into the plains during this time and brings with it several low pressure systems. As you can see from the graph here, April through June are fairly consistent with its number of “Daily Outbreaks”. This is when we offer our tours due to the best possible chances of witnessing a tornado event on any given day during any of these weeks. 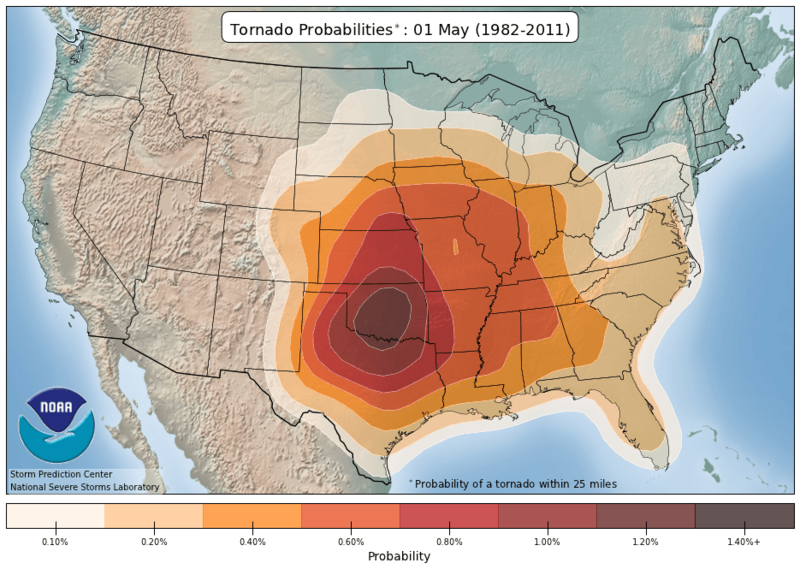 In short, any day from March 20th to June 15th has the same exact and equal chances of witnessing a tornado event, and most definitely a severe storm event. 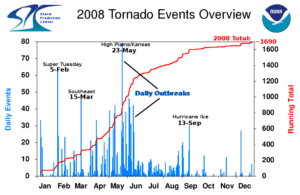 We can also see from the 2008 Tornado Summary that after about the 3rd week of June, the number of outbreak days falls off sharply. The reason for this is once again directly related to the Jet Stream, which begins to become much more linear at higher latitudes as it moves into the Canadian Prairies. After July, most of the outbreak days and events are tropical related, meaning they are associated with the impacts of tropical depressions, tropical storms and hurricanes. These are not the types of tornadoes that we’re interested in. We want tornadoes that are created from Supercell Thunderstorms. A tornado associated with tropical activity will, for the most part, not only be impossible to see due to being shrouded in massive rain, it will also be very short lived and occur in an area that isn’t “friendly” (due to roads, trees and population) for storm chasing. It is impossible, with current technology and understanding, to be able to forecast what day we will be seeing severe storms and/or tornadoes with any amount of consistent lead time. In fact, we can forecast “where” the “best chances” of a severe storm will happen typically starting at about 48-hours in advance, but we (nor anyone else) cannot determine if the severe storms forecasted can or will produce tornadoes. 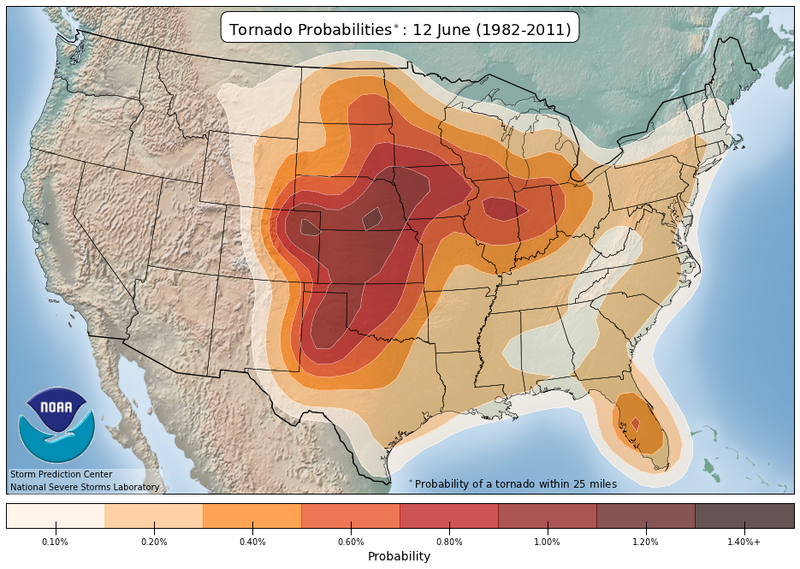 Nobody can forecast which storms will or will not produce a tornado and that is where current science and technology stands. To help you further make a decision we will state that instead of thinking of “when” a tornado might occur, you can decide where you’d generally like to chase. Would you like to chase storms in the southern regions of Tornado Alley, central regions or northern regions? While more of a rule than a law, we can look at tornado climatology summaries to get a general idea of where we might be chasing from week-to-week. As you can see from the “Tornado Probabilities” graphics above (available from the Storm Prediction Center), as we move through May and into June, the probabilities shift to the north. So if you choose a tour during the earlier weeks in May, it’s safe to say that it is “probable” that we will be conducting our storm chasing activities in places such as the Texas Panhandle region or in central Oklahoma. If you were to choose a tour in late June, it’s probable to say that we’ll be conducting our storm chasing activities in areas such as northeast Colorado and throughout Nebraska. This all has to do with trends relating directly to the Jet Stream, which dips into the Southern Plains during the early part of the season and retreats to the Northern Plains during the later part of the season. Again, this is more of a “rule” than a “law,” so it’s entirely possible that an early May chase might take place in Nebraska and a late June chase might take place in the Texas Panhandle, though less probable. On the next page, we’ll discuss storm chasing in the North vs. South of Tornado Alley.